Buttery Jam Biscuits are much like angel biscuits in the way they use both yeast and chemical leavening. Anyone can make them since this recipe is practically no-­fail! 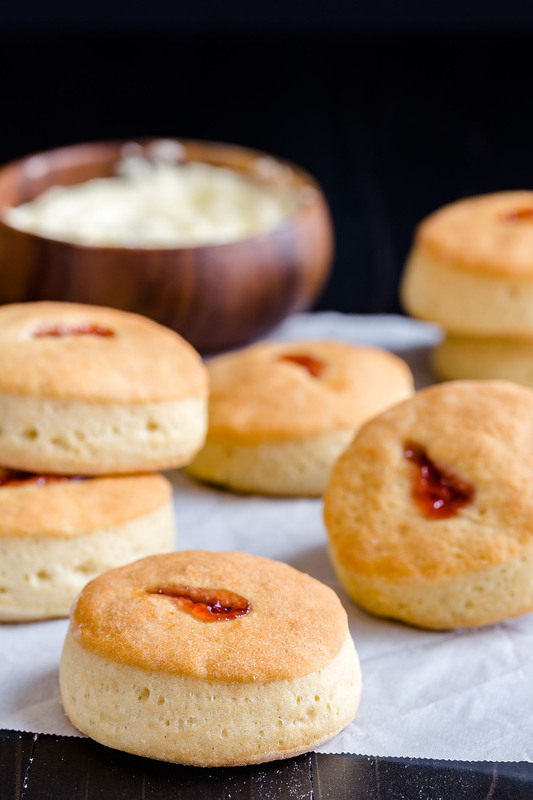 The result is a supremely buttery, light biscuit with a pocket of jam nestled inside. Use your favorite flavor jam or choose one that fits the current season! In a large mixing bowl, combine the flour, sugar, baking powder, baking soda, salt, and yeast. (Put salt and yeast on opposite sides of the bowl.) Stir with a whisk to combine. Place biscuits one inch apart on a parchment-­lined baking sheet. Cut a 1-­inch slit at an angle halfway through the center of each biscuit. Using a piping bag, pipe about 1 teaspoon of jam into the slit. Cover and let rise in a warm place for 10 to 15 minutes. Preheat the oven to 400°F. Bake biscuits for 12­-15 minutes or until golden brown. Serve warm. When cutting the biscuits, take care not to twist the cutter as you cut. Twisting will pinch the seams and the biscuits will bake up misshapen.